That is about the best way we can describe the beginnings of this AWESOME opportunity with Atlanta's Rock Station - ROCK 100.5! Back in February, we were contacted by the station about building a custom truck for them. We set a meeting the following week on-site at the shop to discuss the opportunity, map out objectives, and most importantly - a timeline. A big part of this build was getting a custom vehicle wrap done. With John's background in conceptual design and creative direction, it didn't take much convincing to put a custom rendering together of the wrap, lift, wheels/tires, and other accessories and run it by the station for feedback. As it turns out, they got so excited about it that they posted it on their site that very evening. While excitement and creativity were heavily on our side, time wasn't. The truck's due date was set to April 7th so it didn't take long for us to get on the phone with our top vendors to see which products they might be looking to show off and support the build with! 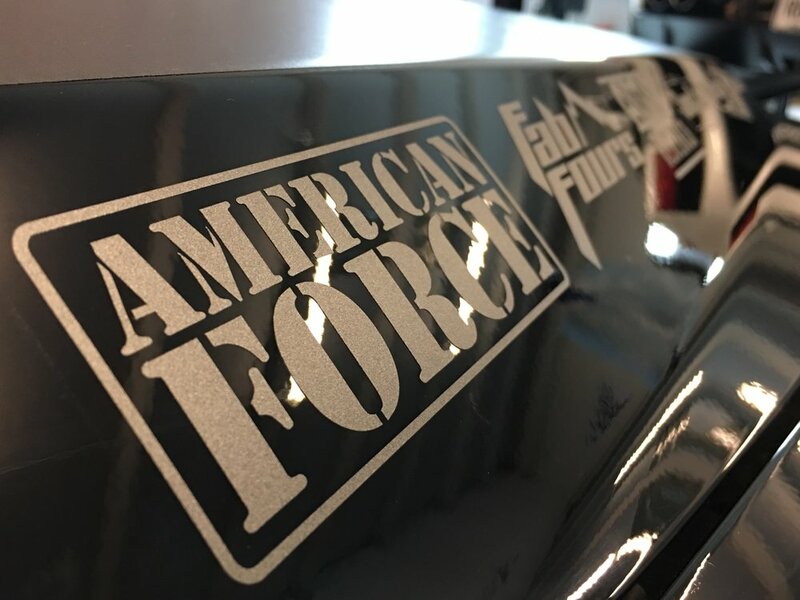 We were blessed with sponsorships from our friends at Falken Tire, Fabtech, Lund / AVS / AMP Research, Fab Fours, UnderCover Truck Bed Covers, and our local heroes - Southeast Auto Shield, Extreme Mobile Audio, and Voyles Performance. With products showing up the week of 3/27, that gave us only 2 weeks to get the build done. No scope of work. Just a team with a dream with an F-350 as our canvas. Before we even run you through the build process... Credit is due. This strategic build for Liberated 4x4 and Rock 100.5 would have been extremely difficult if it weren't for Daniel. From the lift kit and bumpers to the amazing set of wheels that went on this thing, it wouldn't have happened without you, Daniel. Thank you for working so hard to make this vision a very exciting REALITY! Karsten, a strategic vendor of Liberated 4x4, was a life saver with just 4 days left on our build. He helped us land a sponsorship with Falken Tire (read more below) and ultimately helped us get across the finish line. Karsten, thank you for your continued support through our growth. So much more to come! 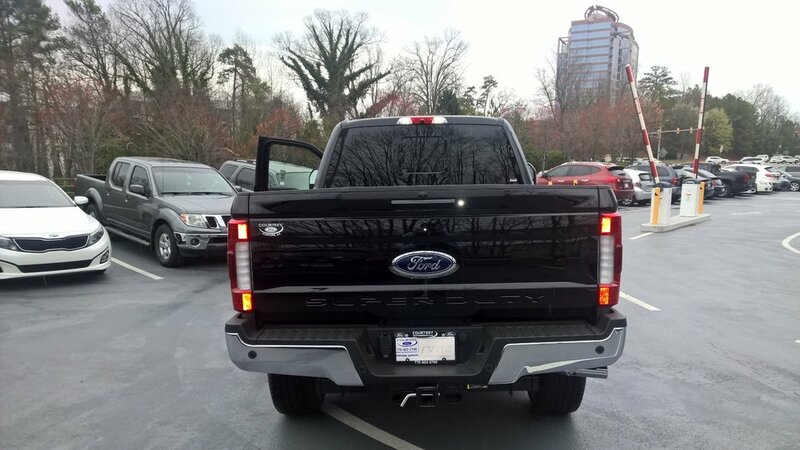 The reason we even HAD a truck to work on is due to the folks at Courtesy Ford in Conyers! 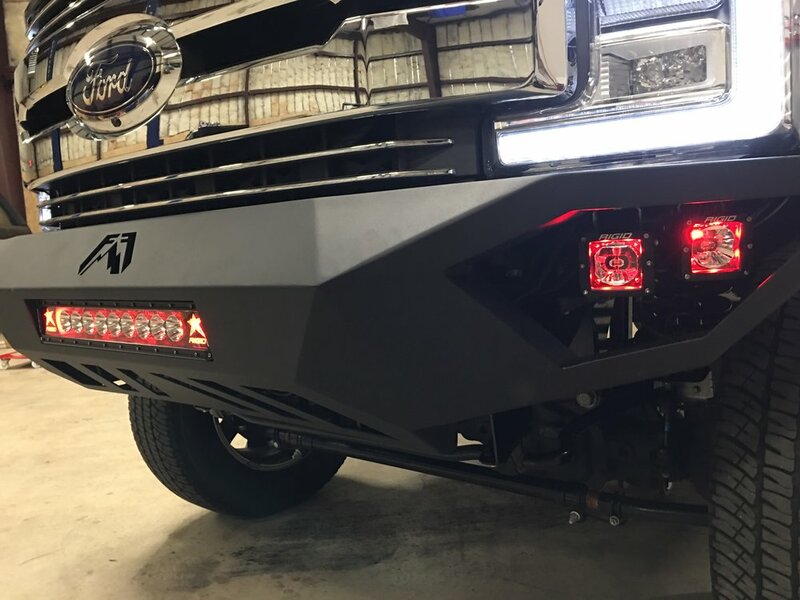 They were the source of the F-350 we were about to customize and were a huge supporter of us when it came to customizing one of their newest, largest, and most expensive vehicles on their lot. We want to give a huge shoutout to Courtesy Ford for providing Rock 100.5 with this F-350 Super Duty which, indirectly, allowed us to customize such an awesome vehicle!! Long days. Longer nights. Unmatched support by the best brands in the industry. 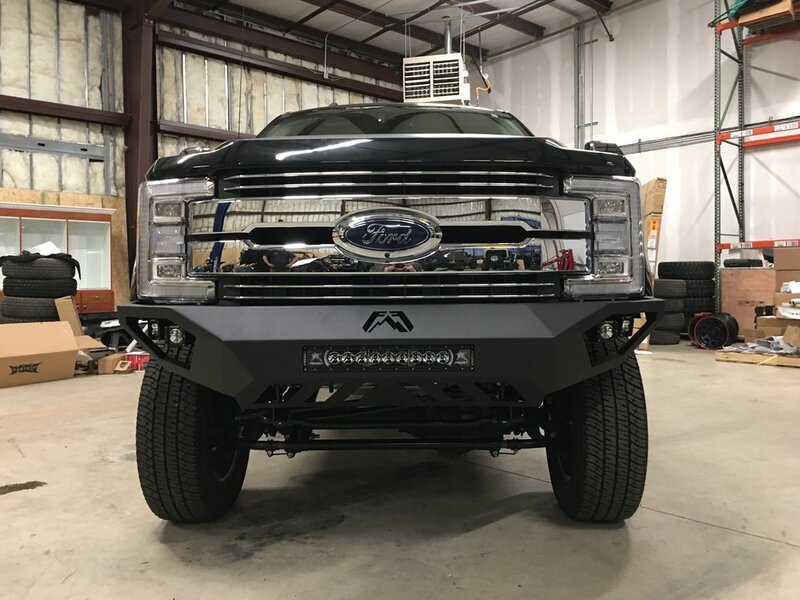 To get things kicked off for us, the team over at Fab Fours sponsored the truck with their Vengeance series front and rear bumpers. Their overall design and fit is "High and Tight" to the contours of the massive F-350 body. 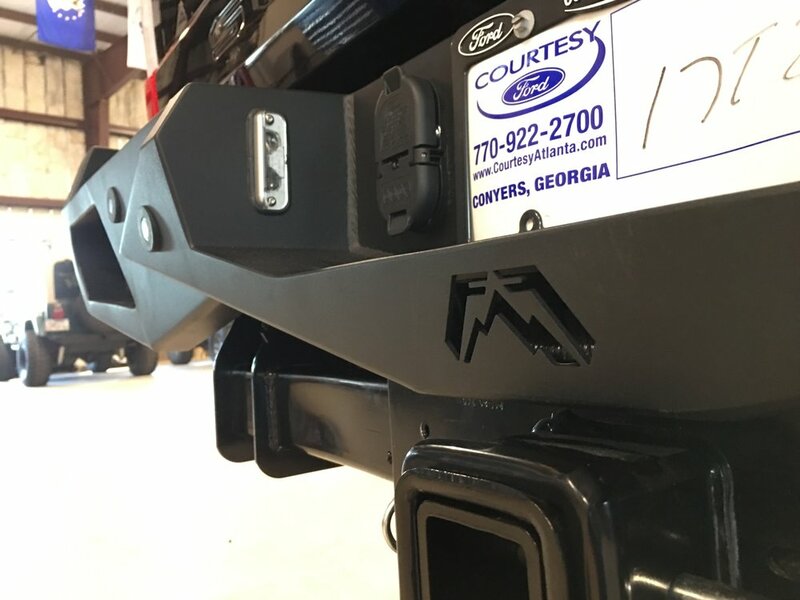 These lightweight, 11 ga. U.S. steel bumpers have a 2-stage matte black powder coat finish and allowed us to install some killer lighting from Rigid Industries. Light installation and wiring was sponsored by a strategic partner of ours, Kristopher Davis, of Extreme Mobile Audio. Our friends and strategic partners over at Southeast Auto Shield went above and beyond on this truck. When we first inquired for a sponsorship into the truck, we were hoping they could assist with installation of vinyl graphics or a full wrap. Dwayne and Kevin took on this opportunity with open arms and went nuts with this thing. 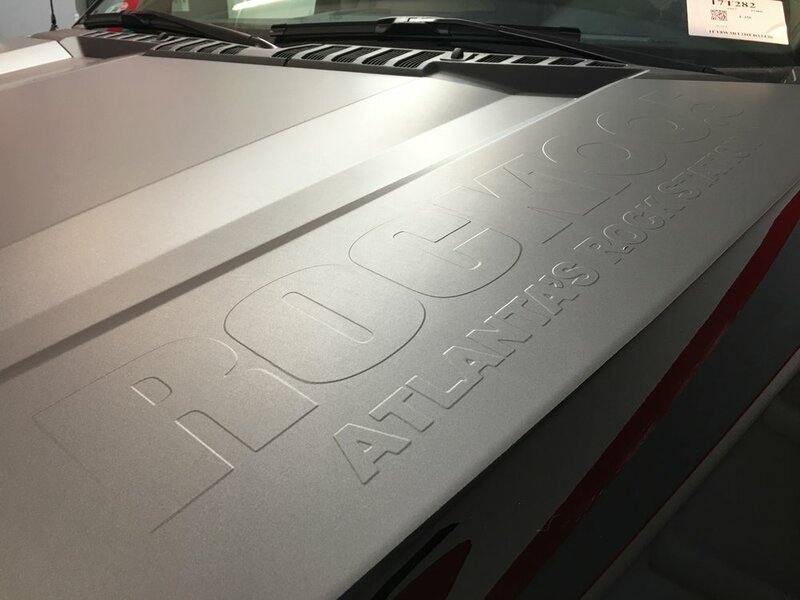 From embossed vinyl effects on the hood and 3-stage embossed application on the tail gate to a huge logo across the roof and custom-tinted windows, the quality and attention to detail on this truck is insane. Instead of doing a few cut vinyl logos here and there and slapping on a 'typical' digital wrap, they went a step further. 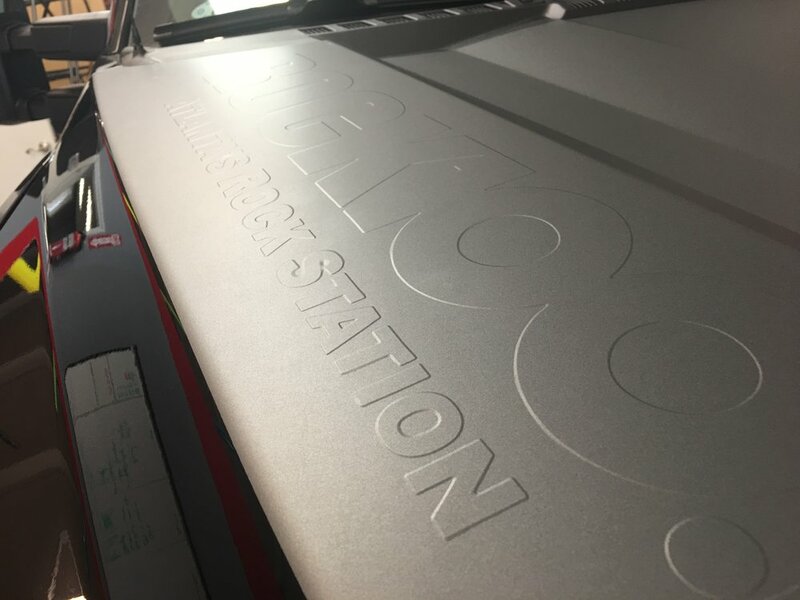 The Rock 100.5 F-350 got three layers of hand-laid cut vinyl. 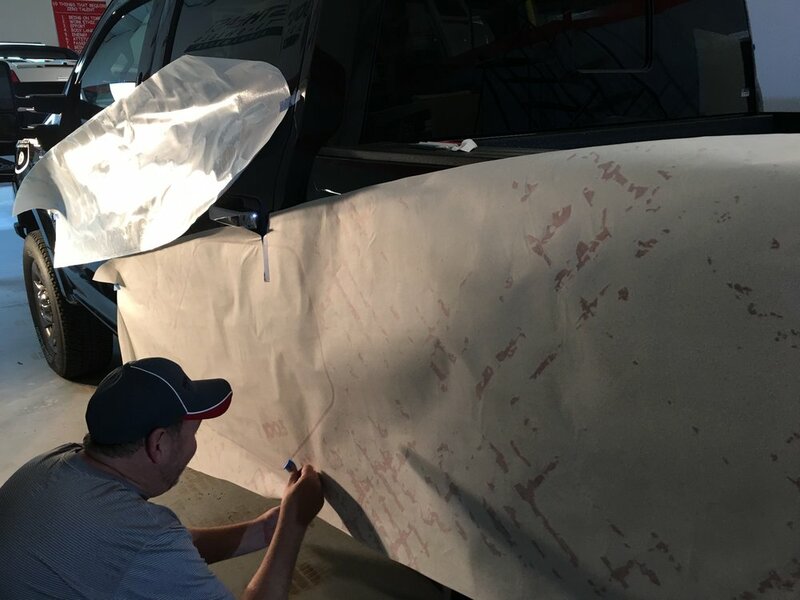 Due to the laborious process involved in laying vinyl, the Liberated team even stepped up to help and after 12 (yes T-W-E-L-V-E) straight hours of plotting, weeding vinyl, and detailed application, the truck underwent its first huge transformation; it got branded. The graphics done on this truck really make it what it is. One of the biggest surprises that came through were the awesome guys and gals at Fabtech Motorsports. 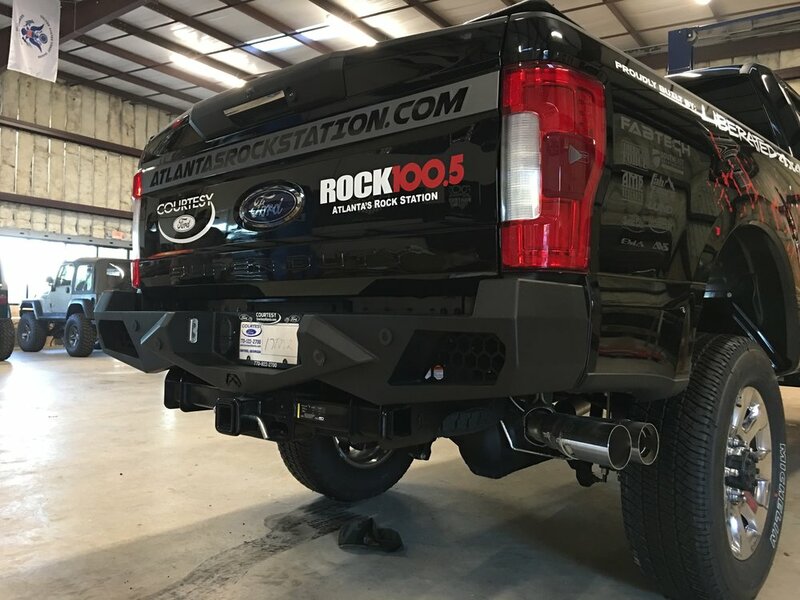 When they caught wind of this truck build for Atlanta's Rock Station, they jumped on board as a title sponsor and sent us a premium 6" lift kit. Talk about a perfect fit... From ease of installation to the blackout design of their lift kit, we couldn't have asked for anything more. The lift itself is a 6" Radius Arm System w/ Stealth Shocks. Their patented Radius Arms feature a full tubular structure strengthened by dimple die side plates, with an adjustable alignment cam at the axle to allow caster adjustment. The factory front springs were replaced with their 6" replacement Coil Springs. Completing this system is a Trac Bar relocation bracket, Pitman Arm, Sway Bar drops, and a rear Block & U-bolt kit. This kit rides like a dream and we were so impressed by the quality that we've set Fabtech as our preferred suspension provider for full-size trucks and SUVs. At Liberated 4x4, we are all about practicality. 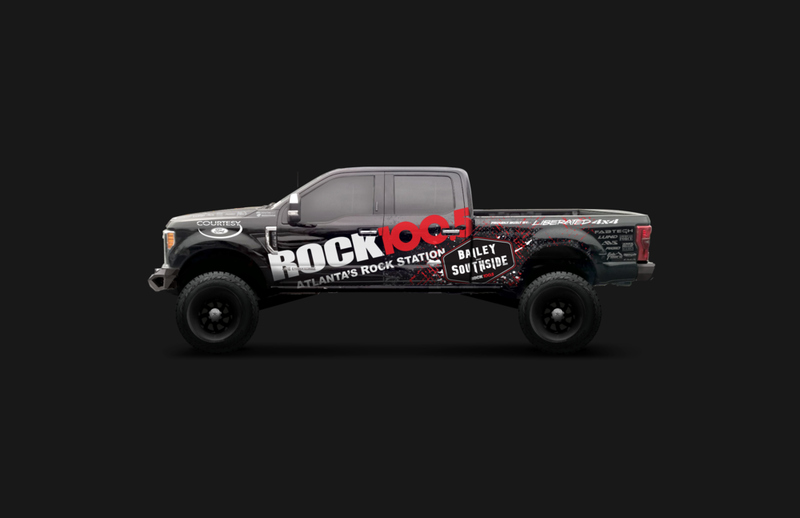 While this truck is intended to be a statement piece at shows and events, it's also the official vehicle of Rock 100.5 and what's the point of having a truck if it's not practical? We reached out to Chris at Undercover, maker of amazing truck bed covers but, more importantly in our case, the innovative SwingCase! If there's one company that blew our socks off on commitment for this build, it's Lund International. Neighboring us just a county away, Lund International is now one of world's leading automotive accessories providers offering functional, high-performance, protective and stylish products from the industry's most recognized brand names including: AVS, LUND, and AMP Research - three product lines that we were blessed to outfit this F-350 with. AVS hooked us up with a set of low-profile Ventvisors and an Aeroskin hood protector which are not only practical add-ons to the truck but really enhance the lines of the vehicle. Next was a Genesis Elite tri-fold tonneau cover from LUND. This premium cover features a low-profile design and premium twill weave HAARTZ™ fabric -- engineered to be resistant to water, mold, mildew, UV, dirt and dust. Additionally, this tonneau cover combines the flexibility of a Tri-Fold and the performance of a full, one-piece seamless cover to protect your gear and cargo. The Genesis Elite Tri-Fold also includes a sturdy, black powder-coated aluminum sub-frame, commercial-grade clamping system and tailgate seal. The last, yet one of the more memorable / favorited items that Lund International came through with were the highly-anticipated AMP Research POWERSTEPS. As AMP says themselves, "getting into your truck shouldn't feel like climbing Mount Everest." We agree. That's why AMP Research invented POWERSTEP™, the automatic, electric-powered running board that instantly extends when you open your door, and then hides itself safely out of sight when the doors close for improved ground clearance, aerodynamics and appearance. Its handsome design, all-weather performance and legendary reliability set the industry standard. It also has an industry-leading 5-year/60,000-mile warranty. Adding a 6" lift kit and 37" tires to an already tall truck really warranted a premium set of steps like this. We were nothing short of impressed! Kristopher from Extreme Mobile Audio selflessly donated his time to this build and wired the steps up with ease. Check out the photo gallery below. Let's face it, this custom Ford F-350 Super Duty was set out to be a statement piece. Frankly, there's no better way to make a statement on a full-size truck than to throw a set of American Force Wheels on it. When we found out American Force stepped up to ship us a set of 20x12 wheels, we could hardly contain ourselves. American Force Wheels leads the industry because they understand that style and function are inseparable. Another differentiator from its competition is that every product is custom – they carry no inventory at all. Since day one, American Force Wheels has made it part of their business operations to first listen to customer's needs and wants, and then design a wheel that delivers the performance and looks desired. Upon arrival, the decision was made to have the wheels powder coated flat black to theme properly with the truck. That's when we reached out to our friend, Jody, at Voyles Performance. Ask anyone around and they will tell you that Jody is the king of hydro-dipping and powder coating so it was no question who we wanted to re-spray these wheels. Talk about a company coming through in a clutch... The at Falken Tire stepped up like no other on very short notice. With only 4 days left on our build, we were so tight on time that we actually sent our Sales Manager, Robbie, down to Jacksonville and back in 24 hours to pick up a brand new set of 37x12.50-R20 Falken Wildpeak M/T's. High-fives. Fist bumps. A chance to reflect. With the build finalized, we pulled it out front and up by the road to show off the hard work of every single person that touched this truck. This build would not have come together if it weren't for every partner in Liberated 4x4, our strategic partners, and arsenal of amazing vendors. Thank you to ALL OF YOU for your dedication to this build!! Time to get it shined up and ready for delivery the next morning. With the build finally complete, it was time to get some finishing touches put on the vinyl and a premium hand-detailing from our friends at Outshine Auto Detail. 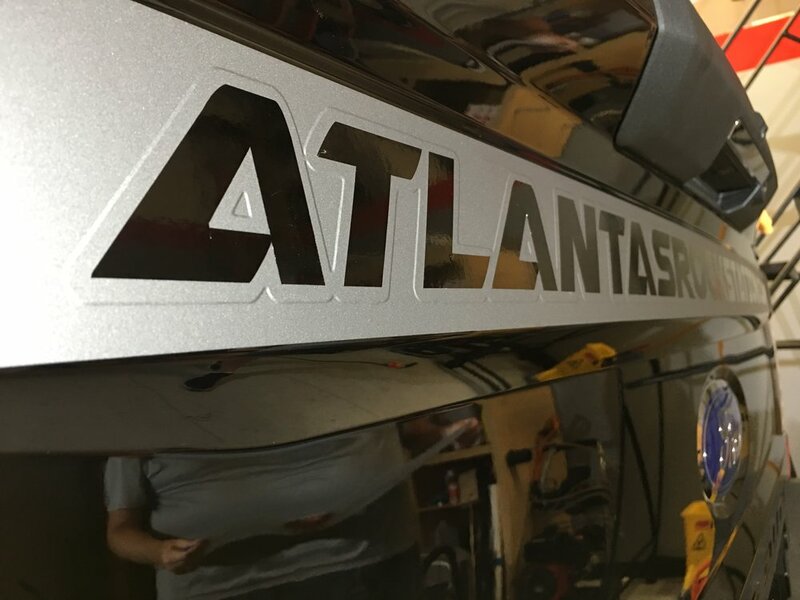 Master Detailer, Zeke Younginer, made the long haul from the Atlanta perimeter (I-285) and detailed the F-350 the night before delivery. Inside and out, this truck was cleaned up and shined up!! You only have once chance to make a great first impression. We didn't disappoint. 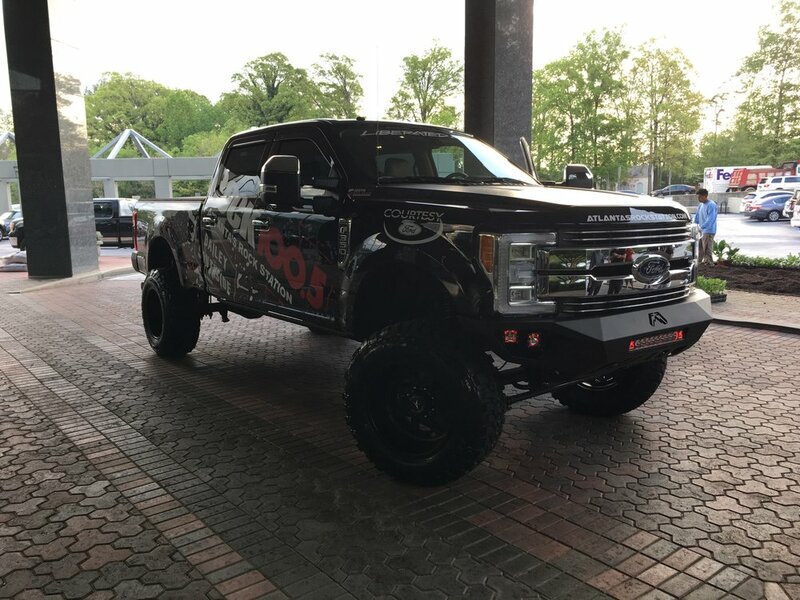 With ALL hands on deck, we were able to complete the truck and deliver the Rock 100.5 F-350 Super Duty on Friday, April 14th at Cumulus headquarters in Atlanta. We got to sit in with Jason Bailey and Steve Rickman from the Bailey and Southside morning show, get on the air for a little bit to talk about the truck, and then get them down to the parking lot to see it for themselves! The Rock 100.5 F-350 Super Duty build took a lot of planning, patience, and hard work, but we had a blast building this beast and it was time well spent. Keep on the listen for our radio ads, creatively architected by Rock 100.5. A little tongue-in-cheek but sure to make you laugh and think about "adding some inches in your life." You'll see this truck all over Atlanta. 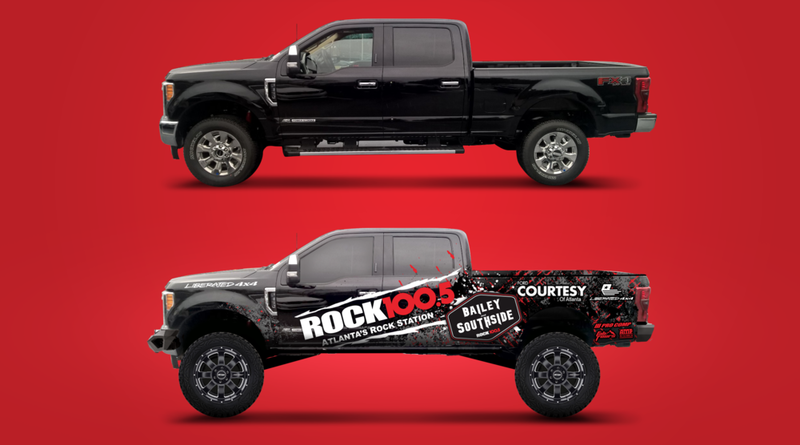 As the official truck of Rock 100.5, you will be sure to see the truck driving all over metro Atlanta. From weekend events to daily promotional opportunities, the Rock 100.5 F-350 Super Duty is sure to turn some heads. Now when you see it, you'll know the entire story behind this project and appreciate it that much more. 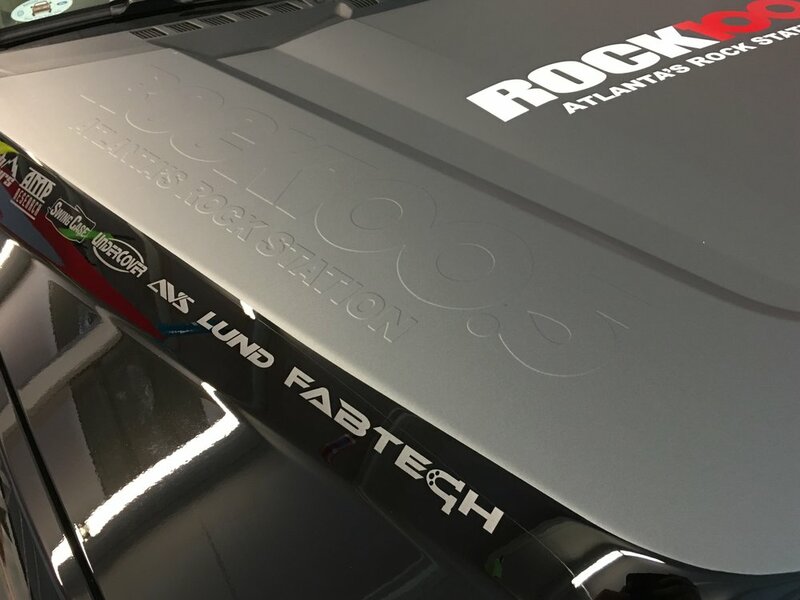 If you get a chance to see it in public, take a picture or selfie with it and use the hash tag #rocktruckatlanta on Facebook, Twitter, or Instagram for a chance to win a special gift from us next month! Lastly, be sure to tune into Bailey and Southside on Rock 100.5 and listen for our ads.